I received this very interesting link from @davelab6 from moneyandbanking.com: “Why a gold standard is a very bad idea“. The article is fascinating because on more than one occasion, some Marxists have accused me of being a gold-bug. The defense of the gold standard, that barbarous relic in the words of John Maynard Keynes, is often held to be a regression to some earlier phase of social production. For this reason, it helps to get a second opinion on the subject. First, when the fascist state fixes the price standard to gold, prices of other commodities fluctuate. Second, with a fixed standard of prices is adopted, the expansion of the money supply is dependent on the output of gold producers. Third, tying the standard of prices to a commodity money means that international trade must be settled in a commodity money. Fourth, mining for gold is a waste of resources; essentially gold is moved from one hole to another. These arguments against a gold standard are pretty weak. Bernanke, on whose lecture the writers base their own argument, offers no reason why, for instance, the price of gold should fluctuate rather than the price of shoes or cars. He does not offer any reason why the supply of money should increase faster than it can be mined. And he doesn’t offer any reason why trade should not be settled in gold rather than dollars. Then the writers make a rather disingenuous argument: having just told us that dropping the gold standard means fluctuations in prices of commodities is replaced by fluctuations in the so-called “price of gold”, the writers compare fluctuations in the prices of commodities before and after the collapse of Bretton Woods. The problem with this comparison is that it is apples and oranges. 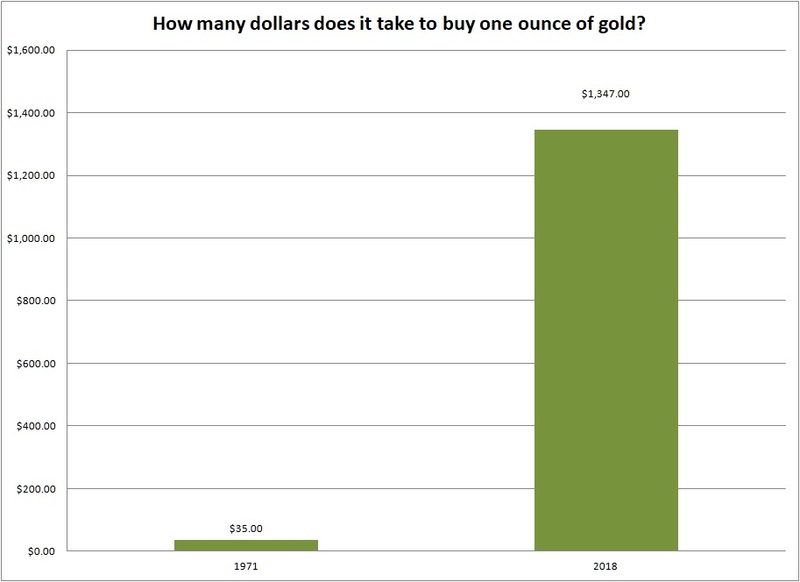 Prices before 1971 were based on gold money, after 1971 they are based on fiat dollar currency. If we are to compare the prices of commodities before and after 1971, we have to use the same price standard in both time periods. If before 1971 dollar prices were pegged to a troy ounce of gold, after 1971 dollar prices still must be pegged to a troy ounce of gold. What would this price comparison reveal? Well, just off the top of my head it reveals that a commodity fetching $35 in 1971, now will cost you a whopping $1,347. This is hardly a argument against the gold standard. Is this chart accurate? You might object that the chart simply shows a change in the dollar price of gold, which the writers have already conceded. Actually, this sort of change is reflected in the prices of all commodities. 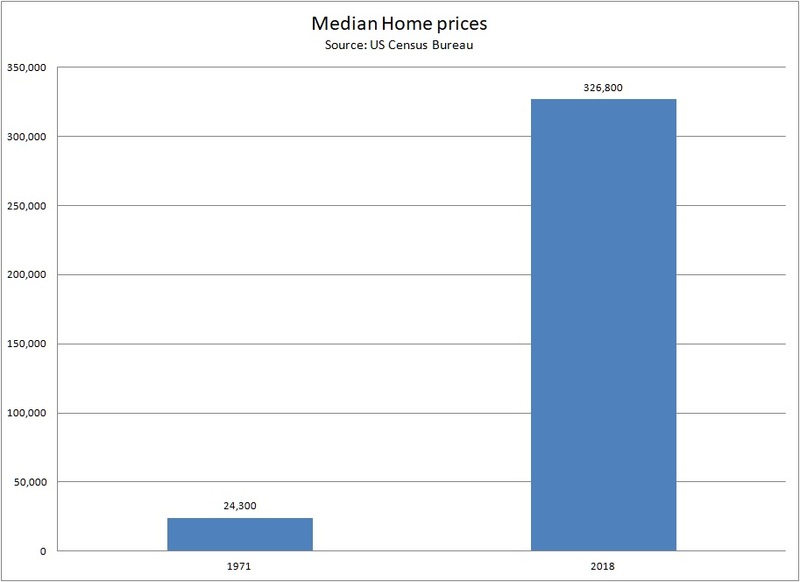 Houses, no less than gold, have seen exactly this sort of price rise as well — as the chart below, based on census data, shows. In the period since the US discarded the Bretton Woods agreement, real prices have increased 3700%. Another way to say this is that the purchasing power of the dollar, what this fiat currency can actually buy you in the market, has depreciated by 97% — a dollar today is worth about 3 cents in 1971 money. When the writers argue dropping the gold standard means fluctuations in the prices of commodities are replaced by fluctuations in the so-called “price of gold”, what they actually mean is that fluctuations in the prices of commodities are replaced by depreciation in the purchasing power of dollars. Gold, like all commodity monies, has no price, what fluctuates is not the price of gold, but the prices standard of fiat dollars. This price standard doesn’t just fluctuate, it dramatically collapses. What all this means is that on average you must earn 37 times what your grandparents made in 1971 just to maintain their standard of living. If you want to buy a house or a car, you need to earn 37 times what they earned. If you don’t earn 37 times what your grandparents earned, you have to work many more hours than they did just to keep up with the collapsing dollar. But as bad as this sounds that is the good news. The bad news is that since 1971 all the labor you have expended was likely empty of any economic value. Almost all of the so-called economic growth the economy has enjoyed since 1971 is fictitious. There was no economic growth. The appearance of economic growth was produced by a collapse in the purchasing power of dollars. Which means every second of your life wasted at work was empty, wasted time. You have thrown your entire life away chasing a phantom, a myth. It is time you will never get back. Gone forever. Ending the gold standard was Washington’s way of constantly moving the goalposts for the working class. Every time we think we are getting ahead, a judicious application of inflation raises the prices of commodities and forces us to work still longer hours of labor. Inflation acts like a treadmill where we are compelled to run in order to remain in the same place. Like a dumb mule we are led to labor with the carrot of a decent standard of living held tantalizingly just beyond our reach. I always thought is was odd, regarding the prices of homes, that people would gleefully cheer for them to rise. Madness. That chart on “Medium Home Prices” was powerful. I would be willing to bet that a chart for automobiles or a chart for food would look the same. Great post, very informative. Keep up the great work.